quit wasting my time !! Cant believe I couldnt find a single separate thread for this super big mega project! Anyways, if somebody has any stats please fill them in and from now on, use this thread for updates on the Lyari Expressway - a project that never finishes. TCF - Change lives through education|| Karachi - A megacity! I pass it several times everyday, but am too lazy to take pics! Anyway, I had a little concern. Take a good look at the first pic. The pillars for the Expressway are right next to the bridge on both the sides. It's the same way everywhere (except 1 or 2). Now, this leaves no room for any of the existing bridges to expand. 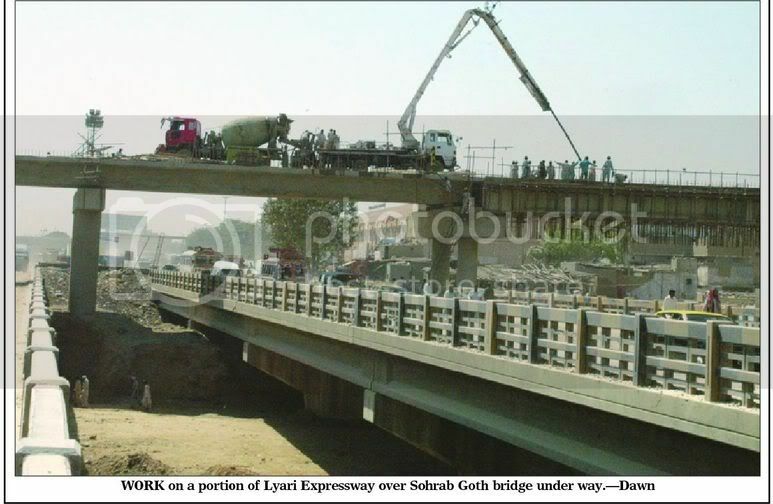 The reason I think it's a concern is that the traffic would grow, and like a few of these bridges (Lasbela, between Sohrab Goth and Gulshan, etc.) have been expanded, we'd eventually need others to be expanded. Now, that's not exactly possible. Second point, looking at the work, the quality looks really really good. The view of his face ruins the picture! ELECTIONS 2008: WE ARE THE ELEMENTS OF CHANGE! Har waqt hoon mein Pakistan ke liye..
To protect his right to privacy. I didnt ask to take his picture. If you guys want I can transfer the photos I took into this thread, but those are from when I was in Karachi. Go ahead if the quality is good. Last edited by adzees; March 7th, 2007 at 08:10 PM. ^ That looks thin, just 1 lane? It looks really good. The quality of construction seems to be first class. Now imagine that road running on both sides of the river and you'll have an idea of what it'll look like when finished. The track is actually two lanes wide. In it's original design it was supposed to be three lanes each way, but they cut it to two lanes to save money. As I said in the other thread, even once the expressway is built it would still leave the ugly, smelly sewerage running in the center of the riverbed. And it really stinks up the surrounding area. In a few years, when they can afford it, they'll have to line the riverbed in concrete and build an underground channel for the sewerage, leaving the rest of the river as a storm water drain. I think that this is a huge accomplishment. I hope that they can complete the rest of it as soon as possible. It looks really good. The quality of construction seems to be first class. Of course..because the FWO (Frontier Works Organization), which is part of Pakistan Army, is making it. I've seen their construction is always top notch. They also built the Mekran Coastal Highway. Last edited by Red aRRow; March 8th, 2007 at 05:30 AM. It's two lane. And the quality is probably the best I've seen. has someone outlined its path on a google earth map yet? Why do states that enforce Sharia always end up as the world's most repressive states? ^ Yes, I've done it several times, let me search and post it here ..